After a five year hiatus, Denmark's Iron Fire is finally back with their third album, entitled Revenge. Their last album, 2001's On The Edge received mixed reviews at best. Their label became disenchanted with the band, and internal troubles within the band soon escalated. As a result, the entire band except for vocalist Martin Steene left the band. Steene would eventually put together a new lineup, but musical differences caused 3 of the band members to leave the band late in 2003. Steene and guitarist Mads Andersen would put together the current lineup, one they hope will be a steady one. That brings us to the band's current, "comeback" album, Revenge. Given the time that has passed since we've last heard from these guys, and the numerous lineup changes, it should be no surprise that Revenge very much sounds like its own album, and is not a carbon copy of either of the band's two previous releases. However, Revenge is rooted in the Running Wild style of power metal that brought them much acclaim with their 2000 debut Thunderstorm. Make no mistake, Revenge doesn't attempt to recreate that debut album, and it does branch out in a couple different directions, ensuring that the same blueprint is not repeated song after song. Tracks on the first half of the album such as Wings of Rage, Ironhead, and Whirlwind of Doom have the classic Germanic power metal vibe ala Running Wild that got me into this band when I first heard their debut. 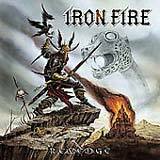 Iron Fire don't score any points for originality, but they do this style very well with strong songwriting and quality musical performances. I don't mind a lack of originality as long as the material is very good. Thus, Iron Fire's lack of originality is perfectly acceptable in my book. Metal Messiah sees the band touch briefly into doom metal territory with a Black Sabbath like riff carrying the first half of the song. The guys pull it off quite well as the song still slithers its way into your memory with it's forceful and deliberate riffing, catchy chorus, and skilled soloing. Sure, the lyrics are cheesy, but this song is a lot better than the title might otherwise indicate. Savage Prophecy is a midtempo anthem that starts with an innocent enough piano, but develops into crunchy anthem flanked by a strong rhythm guitar that reminds me of something from Manowar or Majesty. Fate of Fire is the sixth track of the album, and sees the band shift toward a more traditional metal direction, a bit of a diversion from the first half of the album. While the band possesses the raw talent to play this style well, some of the songs on the second half of the album don't grab me like those on the first half. Stand as King, Brotherhood of the Brave, and the speedy Alone in the Dark are my personal highlights from this batch of traditional metal flavored tunes that occupies the second half of this album. Icecold Arion is a decent, but unspectacular ballad. Mind Machine and Break the Spell both showcase excellent musical performances, but the riffs aren't very memorable, and the choruses fall a bit flat, thereby burying these tracks amongst the stronger material to be found. Gates of Cybertron sees the band shift back towards the all out speed of Alone in the Dark, with the chorus emanating a strong Gamma Ray influence to my ears. The placement of this track is nice jolt to help remedy the previous three tracks that just kind of pass by without creating much excitement. As I've mentioned a few times above, the musical performances on this album are very well played. The guitar work will get your head moving on nearly every track, while the drumming is powerful, yet varied. However, it is the voice of Martin Steene that really pushes this band above the rest of the pack. Steene does not sing in a high pitched, "girly" style that turns many off from this genre. Sure, he can hit some shrieks and even some growls with ease when the music calls for it, but his convincing and melodic mid range voice fits the music at hand just right. Although I feel that maybe three songs from the second half of the album aren't as strong as the remaining material, I can't say that they aren't well executed from a musical or vocal standpoint. For me at least, this is a case where the album could have been shortened by two tracks, still contained plenty of material for a full length album, and still resulted in a stronger end product. After the tornado of lineup changes this band has seen along with the five year hiatus between albums, my expectations were very moderate going in to this album. I can comfortably say that the band has exceeded my expectations. Don't expect Thunderstorm II or even an instant masterpiece, but you can expect a very solid album of European power metal in the vein of Running Wild mixed with traditional heavy metal. If this lineup is a consistent one for Iron Fire, I think Revenge will be the start of a long line of superb metal albums that keep getting better and better.